Well yes…. to eat…. but mostly I love the color…and it does sound so much better in french. Somehow “eggplant” just doesn’t bring up the same feeling. At any rate…a fantastic color and one of the reasons I bought this coat from Musim. Luckily, the next day I found the new Tesla shoes in purple and it was just the look I wanted. The Liriope skin by Ai Baroque is soft and pretty with just the right color eye make-up. Yum-yum for aubergine. Won’t you let me take you on a Sea Cruise? Ooowee, ooowee Baby! …All this cold, dreary weather has made me long for a wonderful cruise somewhere on a blue ocean, sunny and warm. So, I started thinking of what I have in my closet for just such an occasion. I found this…one of my favorites from Ibizarre, a black and white shirt/jacket…perfect cruise wear! I had to show it with two different pants because we all know when you pack for trips you need to get the most out of every piece….changing things up with different accessories or other wardrobe pieces. Ok…so I am ready…but still thinking about what else I have in my closet to take along! I’ll send you a postcard. Hamburger? What hamburger? OK…I was eating a hamburger from Pudge while wearing this outfit. 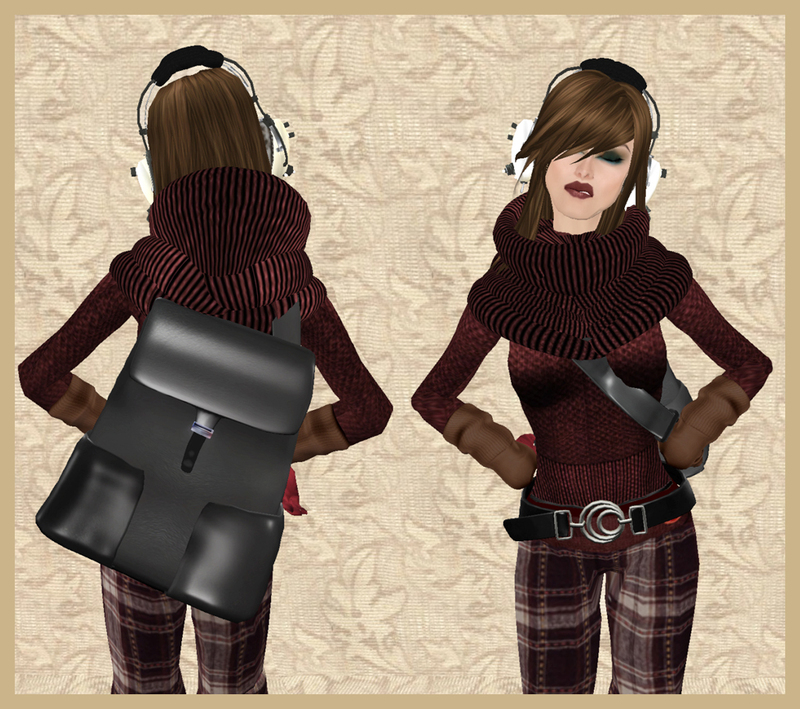 But what I really wanted to show off was the cool new backpack purse from Coco. I have been looking for this type of purse for a while now and snapped it up the other day when I popped into Coco. Just so you know, it certainly was not my only purchase there. (What a cute store….more to come in a future post on that!) At any rate, I pulled this outfit together to wear with the purse…hahaha…sort of the opposite of how it usually works. I also wanted to wear my new pants and skirt from Kurotsubaki and this is how it all came together. I’ve had fun wearing this around for a day or two and hope you like it as much as I do. P.S. The hamburger was yummy. I’ve had this white fur coat from Indyra in my inventory for a couple of weeks …and somehow forgot it was there! Today, I found it (Yay) and decided I had to put together an outfit with it. I really love this coat. The texture is wonderful and…it is all prims so that you get this great, furry shape without losing any of your layers. I put it with this short skirt from DeLa which is so cute with it’s high gathered waist and ribbon belt. And it comes in lots of colors..I had to get the fatpack. O.o. Wanting to keep it simple, I kept to the black and white scheme and only added the beautiful crystal and gold necklace and earrings from Paper Couture. Since this first look turned out rather dressy, I wanted to show you a more casual look that is still sophisticated and new looking using everything except the skirt and boots. The wonderful pants with the folded over waist from Ce_Cubic effect are elegant but have a casual feel with their soft, wool texture and wide legs. Hope you like it. Yes, it is Friday and not a minute too soon…..what a week. So I felt like wearing something really soft and comfy….and I had to go shopping the grid for a Christmas tree and wanted to be warm and still stylish. I started out yesterday…Ok, so it wasn’t yet Friday… wearing the little fur-trimmed, cuffed plaid shorts from DP Yumyum with one of my favorite new coats from BettiePage Voyager. (I love the grey toggles with red leather closings!) If I can’t wear jewelry I usually opt for a scarf or muffler so I found this one from OZ in my closet. And these earmuffs (!) are so cute and fluffy I love to wear them…and best of all they were a free group gift from Boon. After running all over the grid checking out trees, I happened to go to Kurotsubaki (well a girl has to shop) and I found this cute skirt. 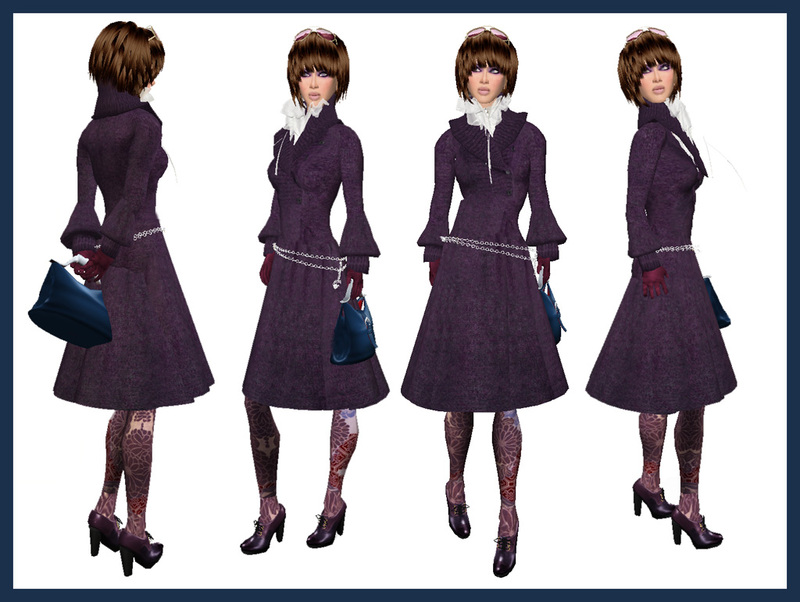 I loved it with the BP coat ….but I also wanted to put together something with it to wear inside….without coat. I remembered this super cute sweatshirt from Untone quilt (also a free gift which you can find outside of the main store). Under it I am wearing a turtleneck sweater from Kurotsubaki. 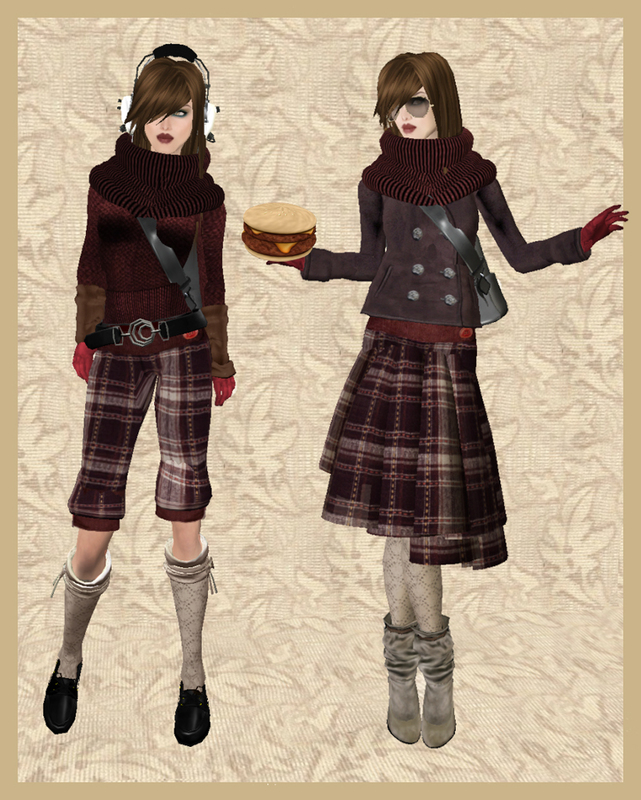 I changed purses for the second outfit..I thought the little brown purse from plod was just perfect for this look. Plus I love the acorns that fall out of the bag all the time you are wearing it. Anyway, I liked the way it came together. Hope you do too.